In a remote western corner of our vast nearly trackless study area – something was not right. We had been hearing rumors for almost 7 months that in a series of isolated villages, the Djonga villages, something had gone wrong for conservation. We had to find out what. That was why we sent Maurice and Crispin on their 11 day trek to the west. Maurice was to find out what wildlife was in the forest, Crispin, whose degree is in sociology, was to find out if what we had heard was true ie, a conservation NGO was “tarred and feathered” or at least banished from Djonga. Maurice and Crispin got an icy cold reception in Djonga – the villagers thought, at first, that they worked for ACOPRIK, the local NGO whose reputation is in tatters. Lambert Papesola an ACOPRIK employee who came from another province was shot in the leg. Other ACOPRIK employees were chased off a study area in Djonga forest. Even now, if a certain Andre , the president of this ACOPRIK, so much as sets foot in any Djonga village, he can expect far worse than bullets in the legs…. But what did ACOPRIK do? Papesola showing the scars from gunshot wounds in his leg. 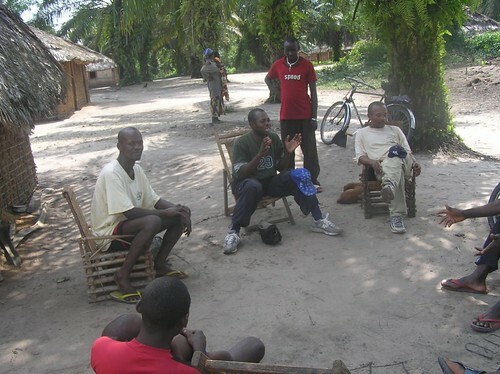 ACOPRIK had been well received by the village on several visits between 2005 and 2007. ACOPRIK came to get the Djonga chiefs to sign documents saying they would not hunt bonobo or okapi. ACOPRIK “sold” their own Djonga forest and officially lost their traditional rights. Word of this fundamental deception swept like wildfire over radio and word of mouth from the capital of Kinshasa. 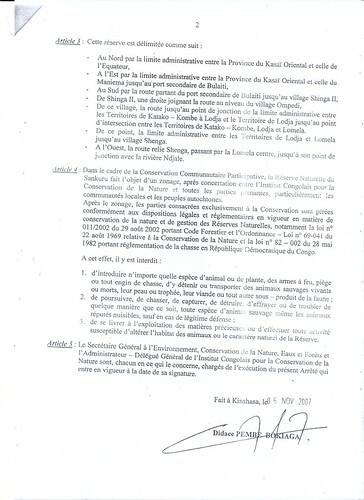 A little research here in Kinshasa , revealed that AKOPRIK’s president, Andre, did push through a decree creating the Sankuru Reserve. He did this just before the last minister of the environment left office. 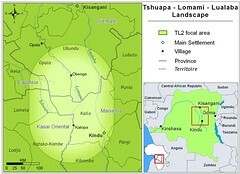 The Djonga villages are indeed within this Reserve on its eastern edge. 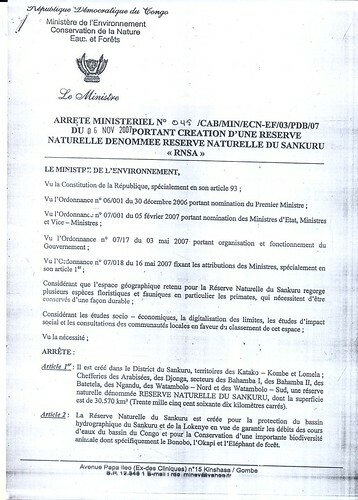 I read the ministerial decree creating Sankuru Reserve (attached here at the very end of the post). Did it take away all the Djonga villagers’ rights? NO. In fact I don’t think anyone could create a more meaningless Protected Area. Limits are drawn on a map but there are in fact no restrictions inside the Sankuru Reserve at all : not on hunting, fishing , farming nor even logging. The statute says nothing except that restrictions are possible at some later date. Good grief. It all seems incredibly ridiculous. What is the point of the joke? Was ACOPRIK trying to delude Djonga for some reason? And delude us? After all this Reserve was announced in National Geographic (Conservation, June 2008, vol. 213, #6 ), in Science magazine (Vol 318, 30 November 2007, p1365 ) and in Time. Or is ACOPRIK planning some second step we don’t know about? Please, if you know the answer, leave a comment. This was during the years of the 1960s. The president of ACOPRIK, Andre, is from the savanna section of the Tetela tribe. 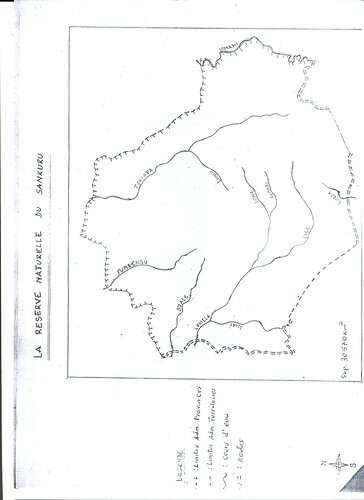 Djonga is the forest section. The problems then and now are those of power and control. What’s more, Andre inspires little trust in his fellow countrymen with a long background in war-time politics (RCD Goma) before moving to conservation. This entry was written by Terese Hart, posted on 2008-07-29 at 6:01 pm, filed under Bonobo. Bookmark the permalink. Follow any comments here with the RSS feed for this post. Post a comment or leave a trackback: Trackback URL. I did a quick Google search on “sankuru reserve” and came up with a lot of hits. The name sounded familiar to me, probably from this blog and the Lola Ya Bonobo blog. The BCI Web site still has a huge section of their home page announcing the reserve. This is really confusing, isn’t it? So there’s a meaningless reserve created? and the local people are pissed off because of a tribal grudge? I don’t have any answers to your questions, apparently. Sheryl, I will keep you informed if I find out anything more. Interesting how little sparks from the middle of the forest can make a fire in the capital, Kinshasa. Apparently there is a parliamentarian, Ekanga, of the forest Tetela who is trying to de-gazette the still meaningless Reserve !! Sheryl, Terese, I know you might find this hard to believe, but this happens a lot in rural Africa and in especially resource rich areas. A perfectly good project (conservation or otherwise) can be brought down by local politics. Just one undesirable individual can send everything spiralling into decay. If one local leader identifies an “undesirable” in the project team then get him/her out of the picture right away. Otherwise the local leader will rally the entire village to oppose the project – mostly to gain political mileage in his quest for a seat in the local council. But then again, deception is also rampant and many times villagers have lost their traditional rights of access to resources through deception. Villagers are almost always receptive to new ways of utilizing their resources as long as they can be convinced that by doing so they will be securing the same resources for their long-term gain. If this MP does manage to get the meaningless reserve degazetted, it’ll be interesting to see how ACOPRIK and BCI handle the press. And who will get the blame? And then Didace was removed from office and DRCongo was left with Sankuru Reserve and all of us were left wondering what “protected land” means. The reserve is a good idea and will help preserve the important land. It is a good thing for conservation. The DCR is taking leadership in declaring Sankuru a Reserve and deserves the full support of conservationists. The negative comments sound like slurs against the DRC. Everyone needs to applaud their leadership and help make the Reserve successful by putting aside petty differences. Wouldn’t it be great if people an supposed conservationists spent the time and energy invested in slurs into positive work. Any Congolese who’s been with any of the RCD outfits is a murderous crook (or a potential one) and doesn’t deserve the trust of peasants and rural people who had suffered in the hands of these gangs of looters. Kudos for the courageous people of Djonga and shame on BCI for backing such criminals! DRC is a member of IUCN and a signatory of CBD. It’s a pity that a Minister officialized a Sankuru “reserve” that does not meet any criteria and protected areas category adopted by the international community. Let’s now hope that the new Minister will swiftly demonstrate its commitment for wise conservation governance by rectifying a situation which does not advance the national conservation agenda.